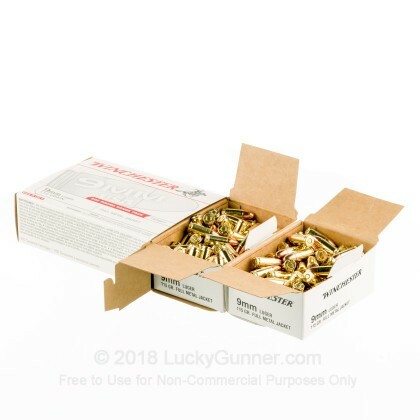 This dependable 9mm Luger ammunition is an ideal range load for new and experienced shooters alike. Manufactured in the USA by Winchester, it provides an excellent blend of low price, good accuracy, and mild recoil. For extra savings, grab this 1,000 round volume priced case! Each cartridge in this case fires a light 115gr. full metal jacket bullet at a muzzle velocity of 1,190 feet per second. They use non-corrosive Boxer primers, reloadable brass cases, and clean-burning propellants that will slightly reduce fouling in your firearms. Since 2011, Winchester ammo has been made in Oxford, Mississippi. A division of Olin, Winchester itself has been around since the 19th century. Although the company historically produced many well-known firearms, its main focus in recent decades has been ammunition. Tossed my first 200 downrange with my S&W M&P9. Had only one ftf. Then I went home and cleaned. Wow! Soot and dirty. I thought maybe I'd left to much oil on the gun and the soot was from burn off. So, I cleaned and left it as dry as I could for next range day. Same black soot with a clean, dry gun. And this time I noticed that every single round had a scorch mark. I thought it might be my gun trying to "chimney" until I ran 75 rounds of my preferred jhp rounds and the brass looked fine. I don't have a micrometer to check, but suspect this might be under sized brass or deep seated lead. This was great, cheap ammo for practice. Groups are consistent based on my terrible shooting. Just plan on using a few extra wads and solvent when cleaning. 500+ rounds and will buy again. I bought 2000 rounds and put over 1000 through my springfield xd in less than 7 days and did not have a single malfunction. Went boom every single time. 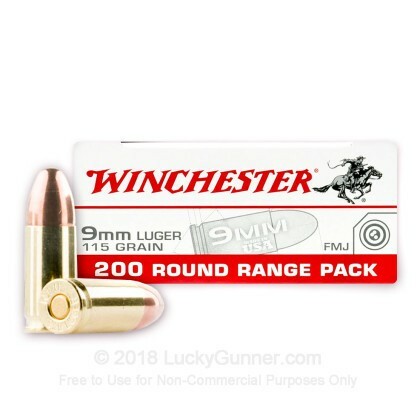 I bought the Winchester ammo from LG after having bought another brand of problematic rounds at a local store. This ammo has performed flawlessly so far. Learned my lesson. Very happy with this ammo. This ammo is as good as the folks that sell it and LG is excellent at service, product, price and packaging. It does not get much better for plinking/practice 9mm rounds. I put a couple of boxes thru a new SW Shield without any problems. Excellent product. Performs perfectly. Fast shipping, packaged well! Lucky Gunner has great deals and fast shipping. 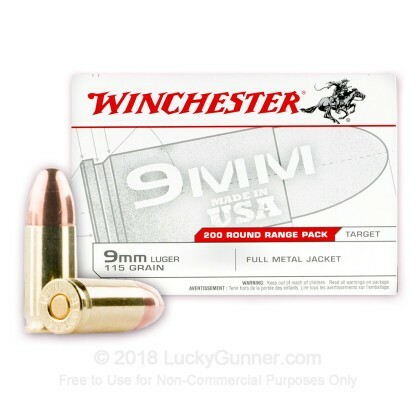 The Winchester 9mm Luger FMJ rounds are great for target practice. Fire great in my Glock and P38. I got 1000 rounds and shot about 300 rounds. I never has 1 jam, 1 misfire or any problems. Lucky gunner shipped in decent box. There were 5 200 box round and inside each of those boxes were 2 boxes of 100 rounds. These are loose rounds so be careful when you open. 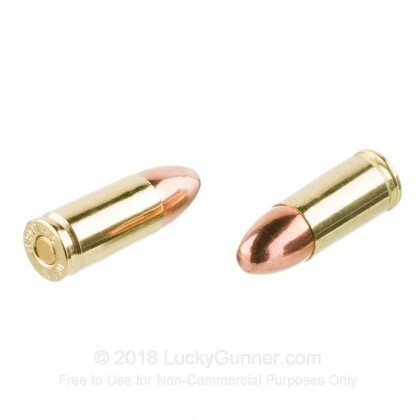 I am definitely going to stick to Winchester 9mm for my range usage. I have fired over 400 rounds and not a single misfire. I am a believer in the old adage, "if it ain't broke don't fix it." I'm sold. All is well, so far. 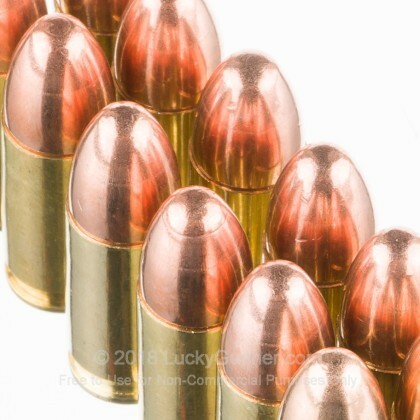 We have purchased approximately 3,700 rounds of .40 S&W and 1,000 rounds of 9 mm. One .40 S&W round failed to fire. That's pretty good percentages. We have been completely satisfied with the service, price, speed of shipment and reliability of product. Easy ordering, super fast shipping. 400 Rounds through my new little friend (Glock 43) so far with no issues. 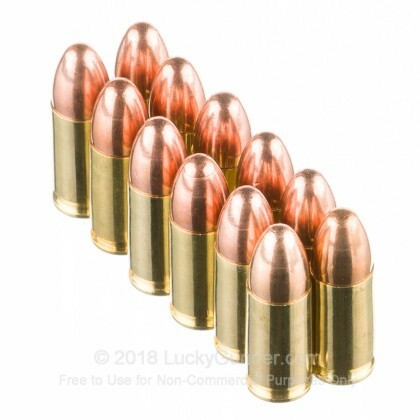 This is going to be my standard range ammo. Put a hundred rounds of this through my FNS9 this weekend. No problems at all. Tore the middle out of the silhouette at 7, 10 and 20 yards. Last week I shot 30 rounds , all of which functioned perfectly, from my Springfield semi automatic.